The "painters' corner," with its picturesque houses and the leaning tower of the St.-Georgs-Kirche (St. George's Church), is one of Hattingen's most beautiful sights. 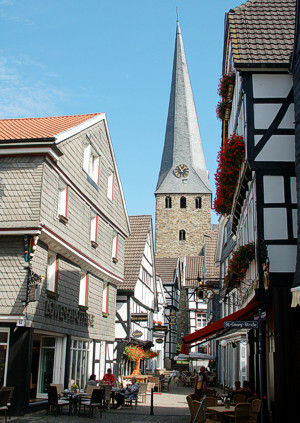 The staircase between the closely standing half-timbered houses leads to the churchyard, the centre of the old town. 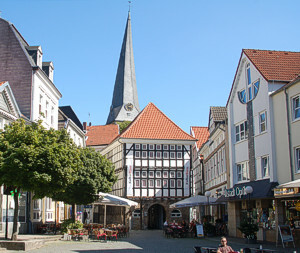 The church square, with St. George's Church and its narrow entrances, remains in its medieval ground plan and is probably one of the most beautiful in North-Rhine/Westphalia. 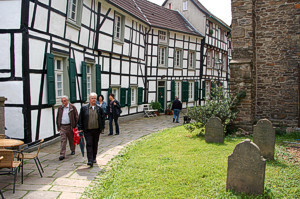 The lovingly restored half-timbered houses and old grave stones are worthy of admiration. The old city hall from 1596 on the Untermarkt (lower market) is likewise one of the most well known motifs of the old town. It contains the city gallery, in which exhibits are displayed and cultural events (cabarets, chamber concerts, readings, lectures) take place (see event calendar). 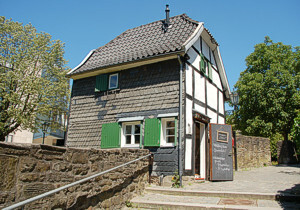 At the Zollhaus (tollhouse), Hattingen's smallest house, you can walk a way along the Grabenstraße. The moats previously formed a ring along the city wall and remain partially intact. 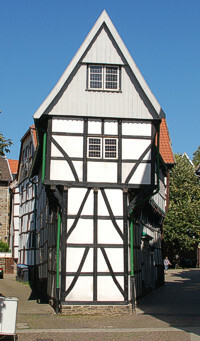 The Bügeleisenhaus (Flat Iron House, built in 1611) borrows its name from its unique form and is certainly a very singular half-timbered house. Today it contains the local heritage society museum and is also worth a look inside. The artwork of the Polish artist Zbigniew Fraczkiewicz adorns Hattingen's city wall near the Steinhagen. 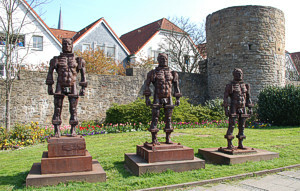 Rusting steel sculptures - the iron men - symbolize the battle for the steel manufacturing site Hattingen. 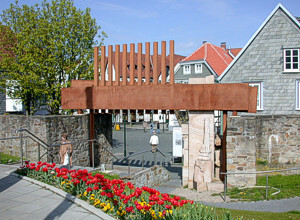 The year 2003 brought Hattingen a new city gate. 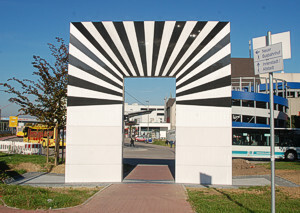 The artist Voré from Ettlingen fashioned a new entrance, embellished with steel figures, to the Steinhagen square and old town. "The watchman," a striking counterpoint to the ambience of the old town. Jan Koblasa's large statue watches over the area of the previous Heggertor (Hegger gate). 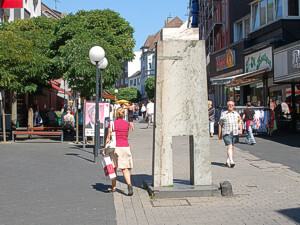 Guardian stones were not uncommon at the city entrances during the Middle Ages. You can experience the "Road of Iron" at the former Henrichshütte (Henrich steelworks). 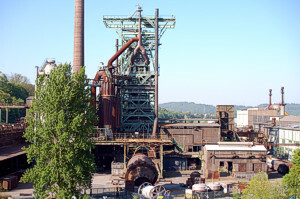 The Westfälische Industriemuseum Hattingen (Westphalia Museum of Industry) offers tours through the former steel manufacturing site. The ascent to the Isenburg ruins (1200 - 1225) is steep and strenuous, but from above, the view over the bend in the Ruhr and of Hattingen are worthwhile. In the Haus Custodis (Custodis House), picturesquely situated on the ridge of the Isenburg, exhibits on the history of the castle are on display. 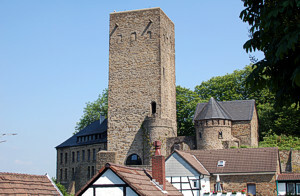 The tower of the Blankenstein castle, whose platform offers a scenic view of the Ruhr valley and the historical centre of Blankenstein, rises majestically above the landscape. 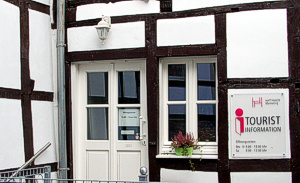 There the Stadtmuseum invites its visitors to take a stroll through the history of Hattingen. 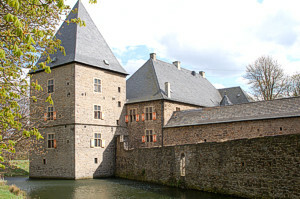 The moated castle "Haus Kemnade" is situated in a lake of the same name, with bike and footpaths, as well as many amusement facilities. 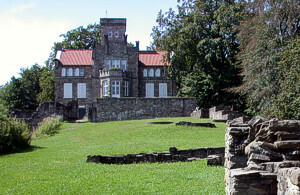 A collection of antique music instruments and gourmet restaurant, among other attractions, can be found in the castle. 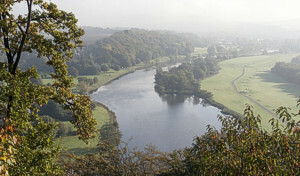 The towpath along the Ruhr was formerly used by harnessed horse teams to pull ships upstream. Today you can stroll and bike there, as well as observe the waterfowl or simply daydream. 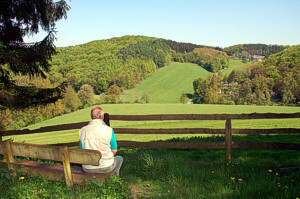 The Elfringhauser Schweiz, the green hilly countryside surrounding Hattingen, offers the perfect place to relax. Numerous footpaths of various distances invite the visitors to stroll and relax in the natural surroundings. Cosy country inns offer culinary delicacies for refreshment.